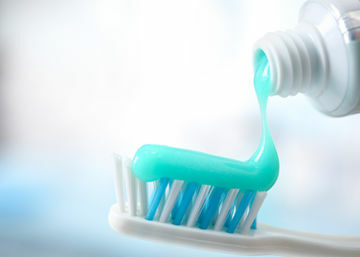 Doctors say to stick with the professional tests—and save your toothpaste for your smile. When it comes to pregnancy—and even just the process of confirming that you are, indeed, pregnant—myths run rampant. It can be tough to separate fact from fiction, but a DIY pregnancy test that's being hyped on some parenting websites seems particularly questionable. The gist of the eyebrow-raising test: You mix urine with toothpaste and wait, like you would with a drugstore test. If the toothpaste turns frothy and a bluish color, you're pregnant. If nothing changes, you're not. Apparently, this method "was often used decades ago when pregnancy tests weren't easily found in stores, especially for women living in rural settings," according to BabyPrepping.com. Google "DIY pregnancy test," and you're bound to find not only this tactic, but a bevy of others, like putting mustard powder in a bath or adding your urine to a bowl of sugar. These may sound cheap, fast, and like somewhat fun at-home science experiments, but none will give you the same assurance as heading to your nearest drugstore and picking up an over-the-counter test or seeing your health care provider. "Waiting to know if you are pregnant or not can be like watching paint dry," fertility specialists Jaime Knopman, MD, a board-certified reproductive endocrinologist, and Sheeva Talebian, MD, OB/GYN, co-founders of Truly, MD, tell FitPregnancy.com. While they acknowledge that "anything that might bring you the answer faster" may seem tempting to try, "some techniques are way more accurate than others, and therefore, despite their accessibility are not going to give you the correct answer." Standard pregnancy tests that check your urine or blood are looking for human chorionic gonadotropin hormone, also referred to as hCG hormone, which is secreted by the trophoblastic—or future placental—tissue, Dr. Knopman and Dr. Talebian say. "As pregnancies grow and advance, the hCG rises. Therefore, a pregnancy test can be faintly positive on Monday and super dark on Friday, as the pregnancy grows and divides the pregnancy hormone rises. In general, urine pregnancy tests are unable to detect an hCG level unless it is > 25, while a blood test could pick it up as low as 3. Symptoms can also suggest that something is 'brewing,' but many times things like breast tenderness, cramping, fatigue, nausea, can also be symptoms that many women feel normally in the second half of their menstrual cycle." Obviously, this is a lot to take into account, but as far as experts like Dr. Knopman and Dr. Talebian are concerned, TTC parents are better off sticking with trustworthy methods to determine pregnancy. "If you want to know if you have a baby on board, start with a urine pregnancy test on the day of your missed period," they note. "If it is positive, call your OB. If it is negative, but you don't get a period call your OB." In other words, keep that toothpaste around to make your dentist happy, but leave the final word on pregnancy to your gynecologist!